Healthy Instant Pot Split Pea Soup :: Stovetop Directions Included Too! 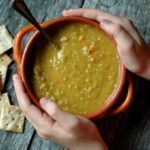 The humble, pantry staple split pea made into a delicious, healthy split pea soup using your Instant Pot OR stovetop! I woke up a week or so ago with the thought that we are almost through fall, and I didn’t even realize it! So we are slowing it down, taking more off the schedule, and making more time for spending with family outdoors before that cold snow hits! Part of me slowing down has been to ask the girls some of their favorite fall and winter foods that we want to be sure to include in our meal plans over the next few months. We all want those most looked forward too meals, and the girls were excited to collaborate on a few favorites. Of course indulgent lasagna, Thanksgiving meal staples, casserole, biscuits, and hot cocoa were all on the list. 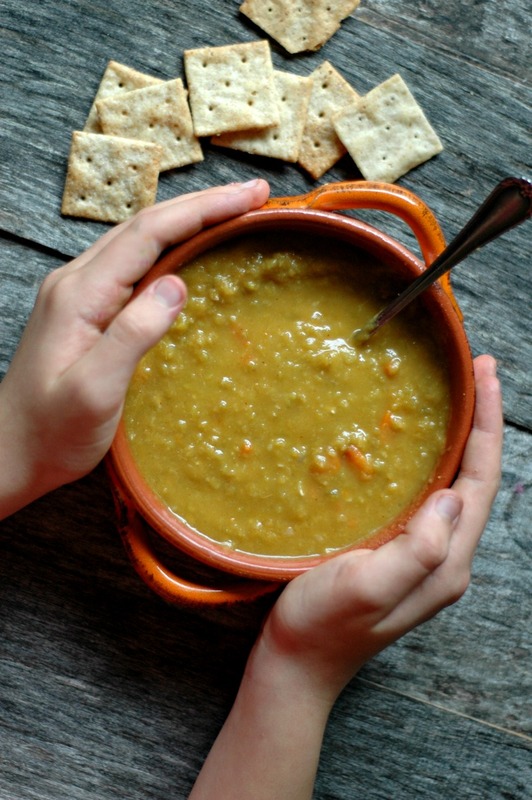 But want surprised me was some of the simpler foods that my kids looked at as “comfort foods” in their eyes – like this split pea soup. 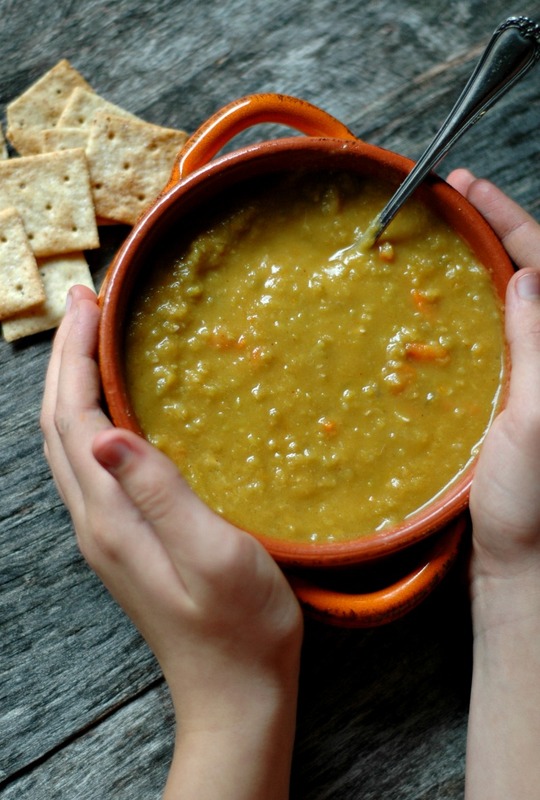 They’ve been eating this exact recipe for split pea soup since they were toddlers! It took me a bit to figure out the exact timing for making it in the Instant Pot, loosely following the IP instruction manual time table for different legumes, but I’ve got it how I like it now, and I’m so excited to share it with you! The humble split pea. It is almost always on my pantry shelf, for a myriad of reasons! 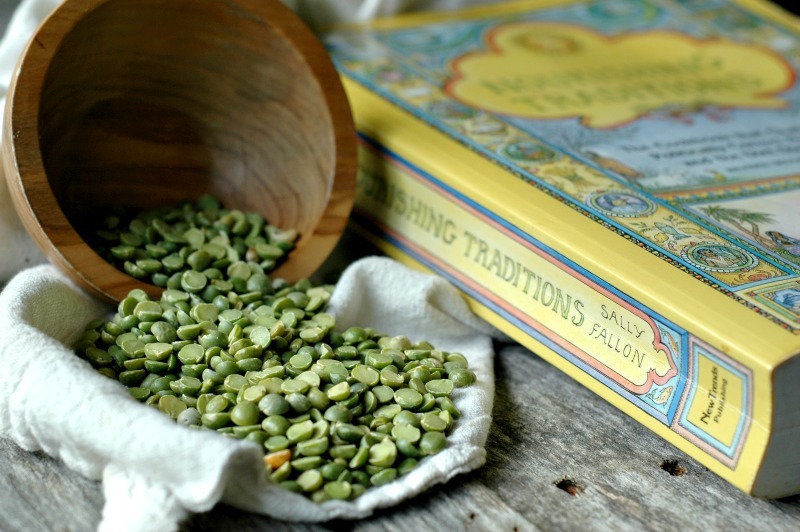 I first learned about peas/dried peas in the very first real food cookbook that I bought, “Nourishing Traditions” by Sally Fallon. So much of the traditional food preparation that I do even today stems from what I learned in this priceless book! At a dollar a pound, dried peas are really one of the most cost-effective ways to feed my family in balance with other nutrient dense food staples. Peas, along with many other legumes are also a great “perfect food” balance of slow burning carbohydrates for energy, and protein. While we are not an exclusively plant-based diet family, properly prepared legumes like peas help me balance meals – because most people don’t need to be eating meat for their only source of protein all day long. And one of the biggest reasons dried peas are almost always found in my pantry is because my kiddos adore them! I purchase split peas in the bulk section of our local health food store. Check around where you shop, or local food co-ops. You can also find them on Amazon. Peas are more than just their fiber – which is a fantastic nutrient benefit by the way! They are also packed with protein, three different B vitamins, and essential minerals that our organs depend on to function together the way they were meant to. We already talked about how the combination of slow burning carbohydrate energy and protein makes peas a great balanced food, so the added bonus of these nutrients is fantastic! Seems a contradiction, eh?! I know it, you bought the Instant Pot so you could make meals…instantly! But if there is one thing this stovetop soup lover has learned, it is that if I want that amazing flavor that so many veggies have to offer…I’ve gotta slow down and let that saute do it’s magic. Don’t skip that step. Get your veggie basics down in the pot with some flavorful fat – I promise it is worth the 10 minute wait. The flavor is a night and day difference. That is all up to you! 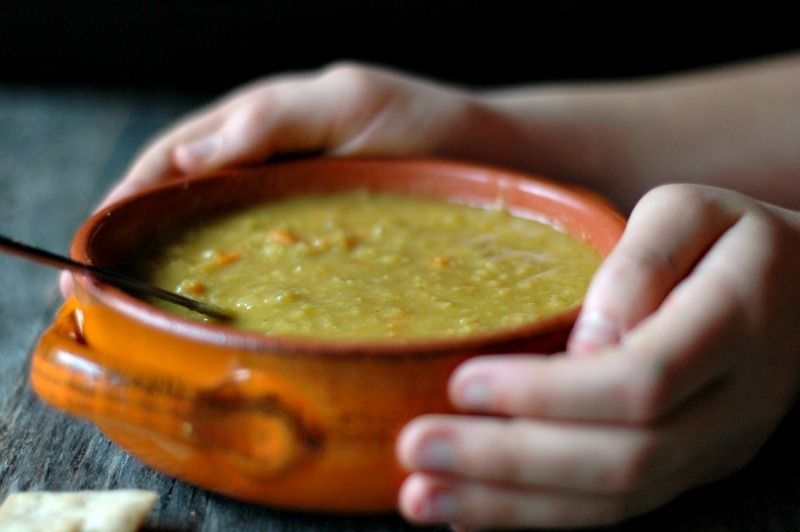 Pictured in this post is the more traditional way of serving split pea soup – un-blended. The little bits of peas and carrots are so fun and colorful. Truth be told, because I served this soup to my little ones as toddlers and tended to blend it up completely so it was easier for them to serve themselves with a straw, all 3 of my kids prefer the soup totally blended. It transforms into this super velvety bowl of soup – the texture is amazing. 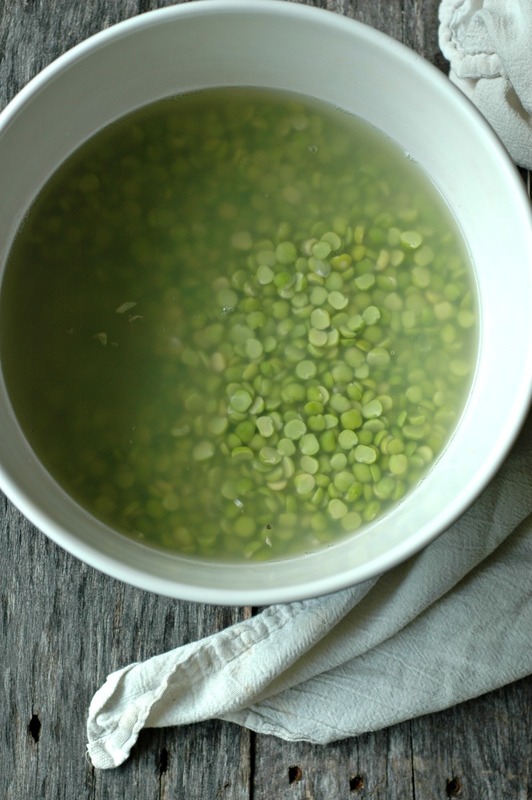 Get the peas soaking first thing in the morning when you wake up to make the soup around dinnertime. Or soak them overnight to make the soup in the morning/early afternoon. You can definitely make this soup stovetop, and I did for years – literally the girls’ entire babyhood! I didn’t have an Instant Pot until my youngest was 2! The absolutely lovely part about making this recipe stovetop, is that you can totally double it up into a large stock pot. In fact, this recipe that I have been using in my kitchen for years is halved to fit into my Instant Pot. I made and froze batches of the large batch for years. Simply follow the same sautéing instructions in the recipe, and then when you get to the bone broth part, just pull your heat up to make the soup simmer until the split peas are cooked through. It will take about 45 minutes to simmer stove top. Cook once, eat multiple times, dear momma! This batch typically feeds my family of 5 for two to three lunches. It freezes up great. As mentioned in the above paragraph, you can double this into your stockpot and cook it stovetop if you want more leftovers. If you have a larger Instant Pot (I have the 6 quart IP), you may be able to get away with a double. I’m not sure if the IP pressure cooking time changes with it doubling into the 8 quart pot – if you do happen to try it, let us know! Six to 12 hours before you want to make the soup, soak the split peas. Soaking helps reduces the phytic acid in the legume, making them easier on digestion. You’ll notice around the 10 hour mark that the peas will have the start of a little sprouted “tail.” Sprouting legumes allows the nutrients in the bean more readily available to absorb. Soak for at least 6 hours and no more than 12. 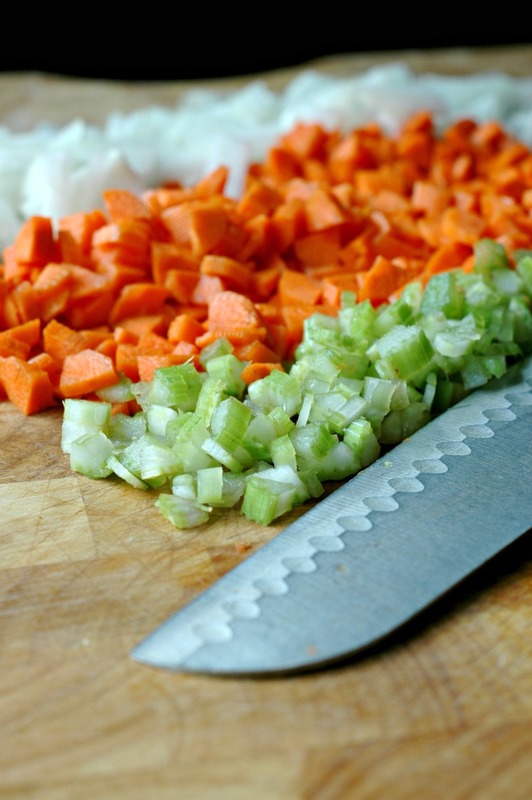 When you are ready to make the soup, turn your Instant Pot on to “Saute,” melt the cooking fat (ghee and bacon grease), and add the onion, carrots, and celery with a big pinch sea salt. Saute for about 10 minutes until the veggies are very soft and sweet. Slow down and don’t skip this step! This is flavor! Drain and rinse your soaked split peas, add them into the Instant Pot along with the bone broth and bay leaf, and stir to combine. Put the lid on your Instant Pot, turn the valve to closed, turn your Instant Pot on to “Soup,” and bring time down to 10 minutes. The Instant Pot will take about 10 minutes to come to pressure before counting down the 10 minutes. When the timer beeps that the 10 minutes of pressure cooking is done, turn the Instant Pot off, and leave the Instant Pot alone for 5 minutes. This naturally will let some of the pressure in the Instant Pot release and finishes the cooking process without overcooking the split peas. 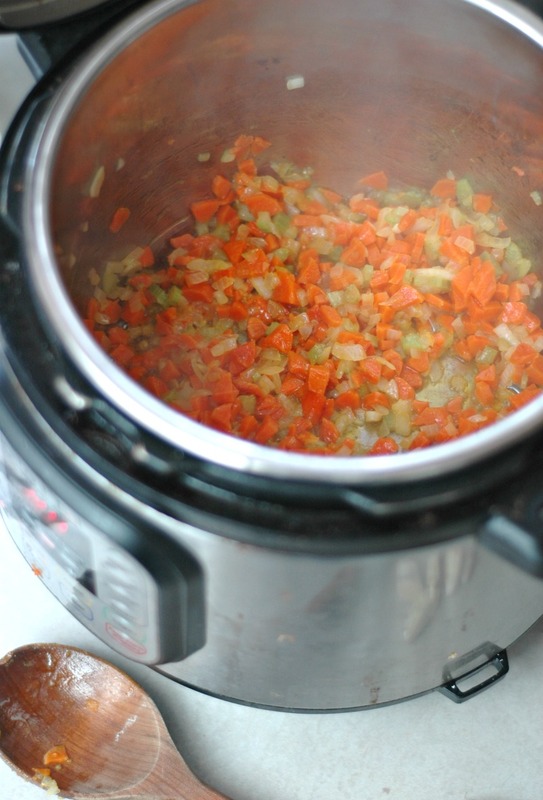 Release the rest of the pressure after 5 minutes, and take the lid off the Instant Pot. Remove the bay leaf. Scoop out 2-3 cups of the soup to a small mixing bowl, and blend with an immersion blender (you could use a regular blender), and then return the blended portion of soup back into the pot with the rest of the soup (it makes the broth nice and creamy!). Stir to combine, and sea salt/pepper your soup to your taste. The split pea soup will thicken a bit more as the soup cools since the peas continue to absorb liquid. You could alternatively blend the entire soup – my toddlers enjoyed using a stainless steel straw to drink their soup this way! 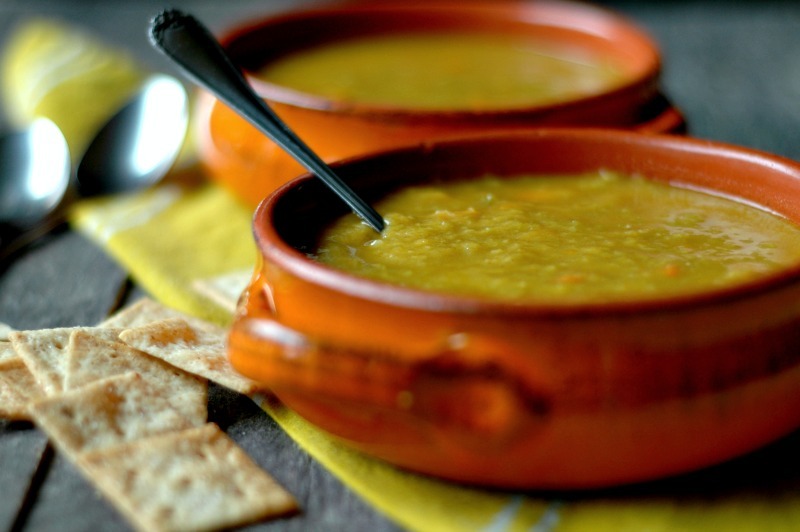 Drizzle olive oil and/or splash raw cream or coconut cream into each bowl of split pea soup to garnish if you wish. 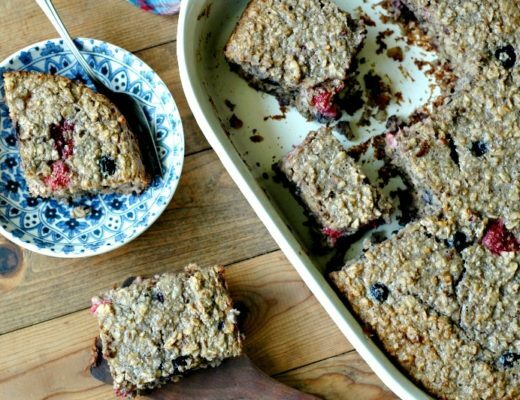 It’s so hearty, delicious, and so perfect for this cold winter! 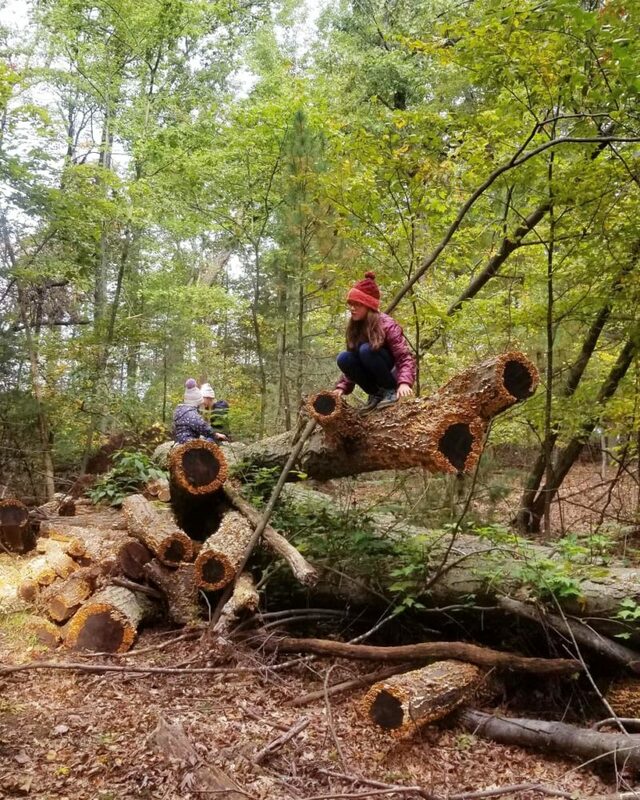 Sweet photo of the girls playing in nature! So – I saw this recipe when you were talking about it on IG and it gave me the biggest smile because it was the one soup my mom made from scratch often when I was a little girl (with a big dollop of sour cream on top). I LOVE your version! It’s so easy and simple and so perfect for an IP soup. My Tiny Love loves peas, so this one is a big hit in our home. 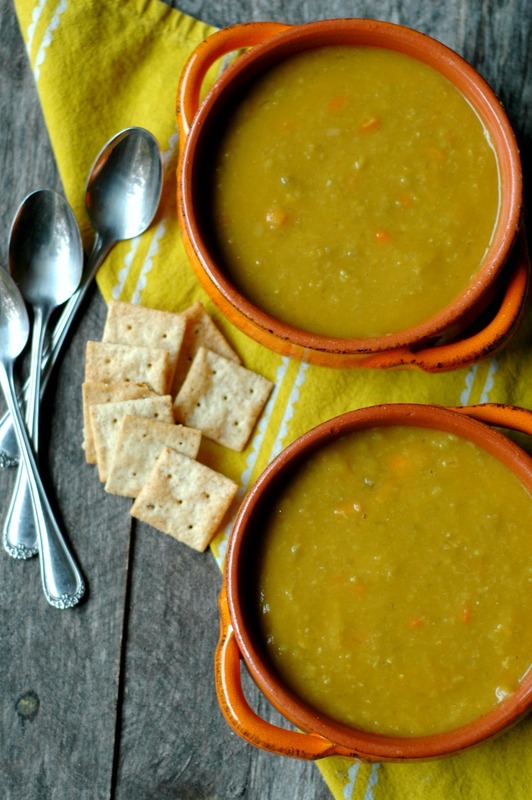 I haven’t had split pea soup in forever but now I’m definitely craving some! I love that it can easily be made in the Instant Pot too. To my surprise I’ve never made split pea soup before! Pinning this to save for later!! That smoked paprika addition is amazing!! Yum! Thank you so much for this recipe. We had it for dinner tonight. Very easy/quick to make and it DID taste just like it had ham in it. Kiddo was sad there was no meat because it sure tasted like it was cooked with some. Amazing!! Love that Anna! Thank you for sharing! Pea soup is one of my hubby’s favorites, and I’ve been on the hunt for a GOOD pea soup recipe for quite a while. This one looks perfect! I can’t wait to try this! Thanks! Glad you enjoyed the soup Irena! I love soup this kind of soup so comforting for a chilly day! There is something so comforting about split pea soup. I love that this one soaks the split peas and uses bone broth 🙂 I’m gonna have to make this one this winter! I’ve NEVER made or had SP soup . . . but I just happen to have a bag of split peas in the pantry . . thanks for the inspo! Oh my, I loved split pea soup as a kid. It is so nice to have a healthier version, and it is an IP recipe, Yes! The bacon grease is a wonderful idea! Love the step by step instructions with photos! I could practically smell the aromas. Adding to my list to try! Talk about comfort food! 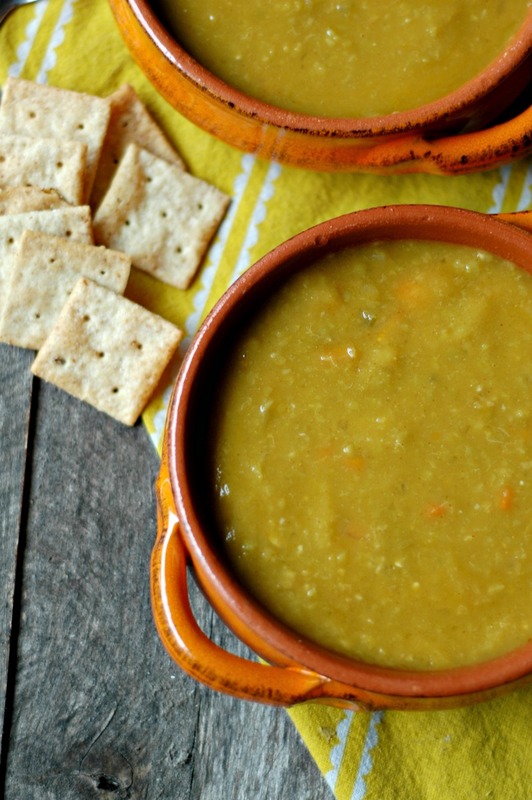 This split pea soup looks so flavorful. Great recipe! 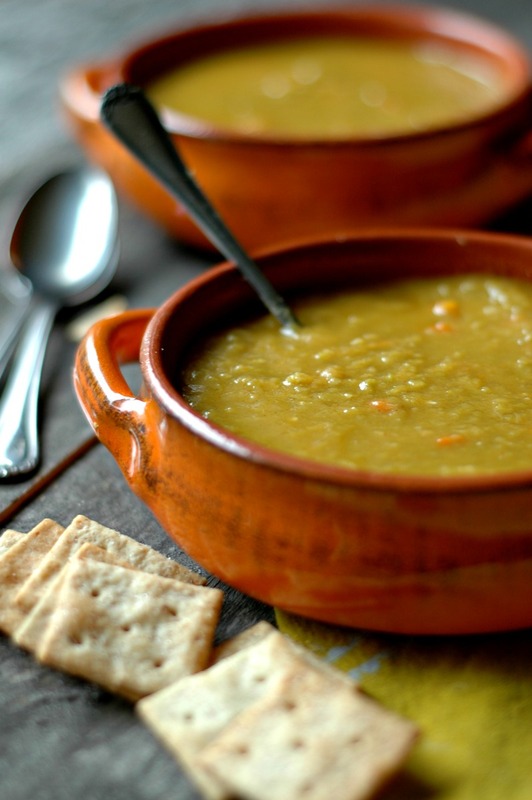 I am so excited to try this yummy split pea soup recipe! We practically live on soups for lunch in the winter and I am needing to up my variety. Also, thank you for the tip on how to mimic the flavor of a ham hock in the soup without the ham! I’ve never made split pea before, but I love how cozy and delicious this looks, and you just can’t beat an Instant pot soup! Such a comfort food!! Can’t wait to try this. Thank you for the great instructions and recipe!